Please feel free to browse our new, unique sample itineraries on our website. We have divided them into East & Southern Africa, as well as 4 categories, Budget, Adventure, Unique & Boutique and Luxury. We have also included web based itineraries on each programme for an interactive experience. SA Airlink is expected to launch direct flights to Skukuza Airport in the Kruger National Park from March 2014. SA Airlink plans initially to offer daily flights from Cape Town and a twice-daily service from Johannesburg with flights from King Shaka International to follow. The flying time from Cape Town directly to Skukuza will be 2.5 hours and from Johannesburg directly to Skukuza 50 minutes. The Embraer 135 regional jet and Avro RJ85 regional jet aircraft will be used for these routes. Exact configurations will be advised nearer the time. This will certainly have a positive impact on your client’s safari experience as they will have direct access to the lodges without paying the current private charter rates. NB: SA Airlink is part of South African Airways. Our second “Tucked Away Places” feature is Malindi, a town on Malindi Bay at the mouth of the Galana River, lying on the Indian Ocean coast of Kenya. It is 120 kilometres northeast of Mombasa. Access is via a scheduled flight from Nairobi direct to Malindi on Kenya Airways, or via Mombasa. Our top hotel in the area is without a doubt Hemingways Watamu. Maybe it’s the location – right in the middle of the pristine white sand beach of Watamu; perhaps it’s the big game fishing – one of the top destinations in the world for this sport, or maybe it is the nine miles of alabaster sand which extends in front of the 76 bedrooms – every one with a view of the warm waters of the Indian Ocean. This sophisticated beach resort is a member of Small Luxury Hotels of the World. The outdoor restaurant is the ultimate setting for savouring the freshest seafood. There’s plenty to do here – relax at the poolside bar of the resort working your way through the extensive cocktail menu; play a round of golf on the nearby world class course, Vipingo Ridge; learn to kite-surf; get your PADI certificate or take a sunset dhow cruise on Mida Creek. We often get asked for a beach & bush combination and this area combines ideally with a safari in Tsavo East Game Reserve, just two hour’s drive away. The world-famous Blue Train is set to stretch its rails to include scheduled trips to Durban from Pretoria and vice versa later this year. According to The Blue Train‘s executive manager, Hanlie Kotze, the Durban route was due to clients’ requests and will allow guests to enjoy a ride through some of the region’s most picturesque landscapes while enjoying the legend that is The Blue Train.. The inaugural trip from Pretoria to Durban is scheduled to take place on 20 September 2013, with the return trip departing from Durban on 22 September 2013. This is a one night trip on the train combined with a 2 night extension at Zimbali Lodge. Boarding starts and butlers usher guests to their suites. Guests enjoy pre-departure snacks and drinks on The Blue Train in the Non-smoking Lounge Car. Dinner on board over two sittings – Remember, dinner is an elegant affair and men are requested to wear a jacket and tie and ladies elegant evening wear. 06h30 – 09h30 Breakfast served (first-come-first-served basis). There is an additional trip planned for November 2013 and then approximately 4 departures in 2014. Alternatively, for groups, the Blue Train is available for charter purposes. The train can sleep a maximum of 82 passengers. Our operations team paid a recent visit to Madikwe Private Game Reserve to get a good understanding of the area. 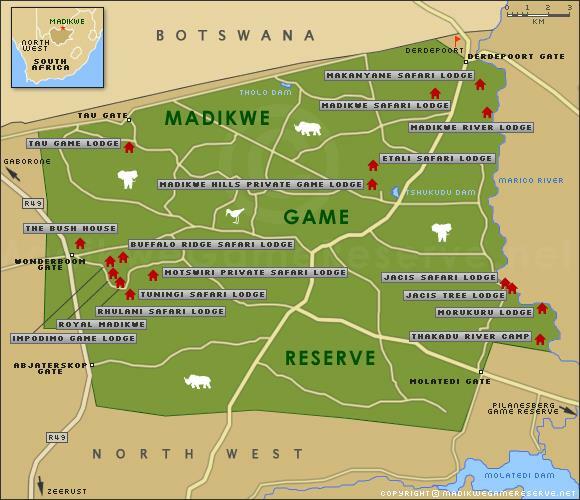 Madikwe is situated in the North Western Province, along the Botswana border. It is 750 km square (75,000 hectare) of reclaimed farmland, established in 1991. It is the country’s 5th largest game reserve and specialises in wild dog, but has all the Big Five (lion, leopard, rhino, elephant and buffalo). Madikwe encroaches on the Kalahari Desert, and is very dry. Access is by road; it is a four hour drive from Johannesburg and 2 hours from Sun City, or air, with Federal Air offering scheduled charters. Our team flew up with Federal Air departing from Johannesburg at 12h00 to Madikwe, with the return flight being at 13h30 every day. It is a mere one hour flight from Johannesburg. There are two airstrips. The Western Airstrip is basic and can accommodate maximum a 12-seater Caravan, the other being the Eastern Airstrip, which is tarred and has a building for arrivals, with toilet facilities. It can also take a maximum 12-seater Caravan. There are over 20 lodges in the area, some are privately owned by corporates or for personal use only. Most of the group-friendly lodges are located in the East, with the furthest lodge being 35 minutes transfer from the airstrip. In fact combining Madikwe Safari Lodge (20 suites), Makanyane Safari Lodge (8 suites), Madikwe Hills Safari Lodge (10 suites), Mateya Safari Lodge (5 suites), Jamala Royal Safari Lodge (8 bedrooms), and Molori Safari Lodge (5 suites) one could get a total of 56 rooms in close proximity to each other. Etali Game Lodge (8 rooms) and Jaci’s Camp (16 rooms) could be used for overflow. This is a non-malaria area, a definite plus! The team were very impressed with the quality of the lodges, most of which are luxury 5* properties. More importantly the quality of the game viewing has improved considerably. Madikwe Game Reserve is without doubt establishing itself as a renowned safari region, to rival the Sabi Sands and other Kruger National Park lodges. The Zambezi Explorer is a luxury catamaran that cruises the mighty Zambezi River upstream of the Victoria Falls in Zimbabwe. 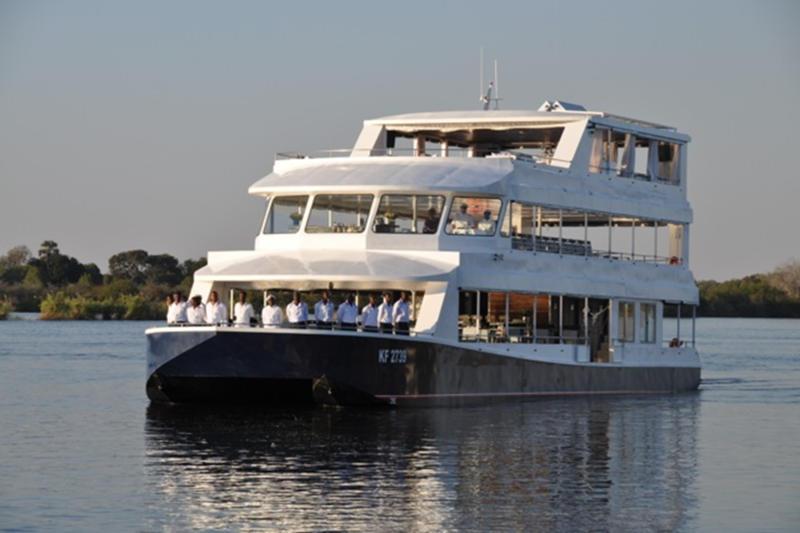 This modern catamaran lets you enjoy the best of the Zambezi River in comfort and style. Enjoy the abundant wildlife on one of our many cruise options. Private functions can be arranged on part of the boat, or the whole boat can be hired. The boat is almost entirely powered by the sun. There are three decks on-board the Zambezi Explorer. The two lower decks provide a 5 star luxury service where guests can choose from an exciting range of beverages and cocktails as well as a selection of delicious snacks. The ‘Signature Deck’ is the third level and it is pure luxury with gourmet hors d’oeuvres and a wide range of premium beverages served from a private bar. Guests can relax in the comfort of the deep set couches and enjoy the extravagance of VIP service. For more inspiration from this region watch this You Tube UNWTO Destination Video Zim / Zam 2013, makes me want to jump on the next available aircraft! I thought I would do a monthly feature on an area in our destination that is not well known. 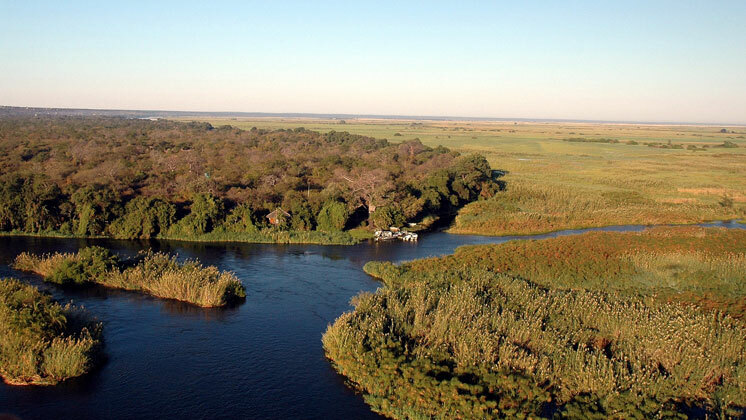 The first feature is on Impalila Island located near the confluence of the Chobe and Zambezi rivers, where Namibia, Botswana, Zambia and Zimbabwe meet. It is home to some 300 people in 25 small villages, including Tswanas and Subia people. The top property is Impalila Island Lodge which features 8 river-facing wood and thatched chalets and offers numerous activities. Access is by boat, boarding at the Kasane Immigration post in Botswana. After much speculation, it has been confirmed that Four Seasons will take over management of The Westcliff hotel, marking the entrance of the international brand into the South African market. Four Seasons has signed a long-term management agreement with the owners of The Westcliff, Albwardy Investment and Hotels Properties Limited. 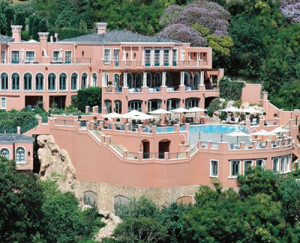 The property will reopen as Four Seasons Hotel Westcliff Johannesburg at the end of 2014, following renovations. This marks the entrance of Four Seasons into the South African market and its second on the continent – Four Seasons Safari Lodge Serengeti in Tanzania opened last year. Hot on the heels of our Rwanda feature last month, The Protea Hospitality Group has signed a deal that will see Africa’s largest hotel group moving into its 10th African country, the beautiful equatorial Republic of Rwanda, famous for its Mountain Gorillas. A 25-room hotel in the upmarket suburb of Nyarutarama in Rwanda’s capital city, Kigali will become Protea Hotel Kigali when it opens in the last quarter of this year and represents a great step forward in the Protea Hospitality Group’s growth in East Africa, says company CEO Arthur Gillis. Protea Hotel Kigali will offer standard rooms, as well as eight two-bedroom units specifically for the long-stay market. The hotel will also feature a 60-seater restaurant, a bar, gym and swimming pool, plus two executive boardrooms for meetings and conferences on site. Rwanda is a developing nation of approximately 11 million people. African Economic Outlook sets the country an expected GDP growth of nearly 7% for 2013.